Let’s show this world that being haters and negative for the sake of crying for attention is old news. It’s that’s not just a saying, its damn true. If you’re unhappy find ways to change it. Do not put that in the hands of others!! Breathe and be happy that you woke up this morning. That’s a gift and another day to go get your happiness. Stop hating and playing the wounded animal. In the end, WE create our own heaven as well as our own hell!! Go be creative and get yours!!!! Our book is now available on Amazon! To say Justine DeNicola and I are excited is an understatement!! Thank you all whom have been so supportive of this project. Every one,who’s anyone. Did what most would deem to be impossible. Proof copy of our first book is in!! First I want to thank you the followers and the supporters of this blog and my projects. Your support means the world to me. So a big heartfelt thank you. Today was a day of joy. 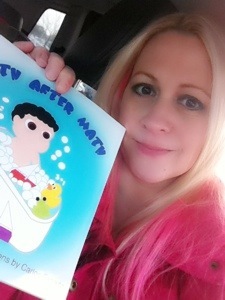 We got in the proof copy of our first children’s book “Bath After Math”. It was great to see Justine’s face light up as she was able to hold the very book we worked so hard for. It’s always an amazing feeling when you are able to physically hold something that started out as notes and sketches. The book will be available on Amazon in 2-3 weeks. This is a great little story and loaded with fun activities for the wee ones. Rest assure we will see Harry appear in more books in the future. such toy lines as Star Trek, Star Wars and both Marvel and DC comics. 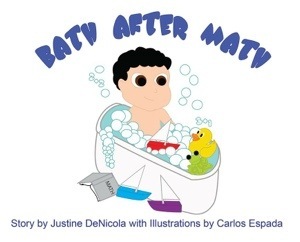 So sit back with your little one and enjoy MATH BEFORE BATH.